External hard drives make it plug-and-play easy to add storage capacity to an existing PC or laptop. 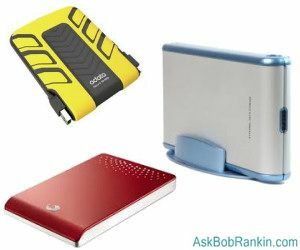 An external drive is also handy for storing backup copies of data, especially if you want to back up multiple computers around the home or office. Here are some tips for buying an external hard drive. There are two broad categories of external hard drive. Desktop drives with 3.5 inch mechanisms inside are designed to stay in one place, usually on your desktop. They generally require a power adapter. Portable hard drives are based on 2.5 inch or 1.8 inch mechanisms, making them small enough to fit in a shirt pocket. Portable drives typically get their power from the computers to which they attach. Desktop drives currently come in capacities up to 3 Terabytes. If you need even more storage space, look for models that stuff two or more drives into one chassis. Portable drives max out at 1 TB, but capacities of 250 MB to 750 MB are more common and less expensive. Which Interface: USB, Firewire or eSATA? One thing that many shoppers find confusing is how best to connect the drive to their computer. External hard drives may have more than one type of interface. USB 2.0 is the most common interface, supporting data transfer speeds of up to 480 Mbps. Firewire 400 and 800 are also common; they transfer data at 400 or 800 Mbps, respectively. An eSATA interface can move data at up to 3 Gbps (3,000 Mbps), making it a favorite if your computer(s) support eSATA. Unfortunately, eSATA does not supply power over its cable (as USB does), so an eSATA external drive will need a separate power cable. USB 3.0 is even faster than eSATA, at up to 5 Gbps. Intel’s Thunderbolt interface is rare (except in Apple computers) but it will hit 10 Gbps. If speed is a crucial factor for you, check your computer’s manual (or inspect the ports if you’re familiar with them) and purchase a drive with the fastest connection that your computer will support. If speed isn’t of the essence, you’ll probably find a good deal on a drive that connects with a USB 2.0 or Firewire cable. Just be aware that some el-cheapo drives do not come with the required cable. External Solid-State Drives (SSDs) are available, but they are very expensive on a per-gigabyte basis compared to traditional spinning magnetic drive mechanisms. A simple USB 2.0 500 GB spinning drive may sell for $89, while an eSATA external SSD of the same capacity will cost nearly $2,000! For more information on SSDs, see my article Solid State Hard Drives. The rotation speed of an external hard drive does not make much practical difference, in most cases. Yes, a 7200 rpm drive is faster than a 5400 rpm drive, but you won’t see the difference through a USB 2.0 or Firewire interface. Both transfer data slower than most 5400 rpm drives can. Remember the old adage about the weakest link in the chain? Case in point here. Excellent external hard drives are made by a number of well-known brand names; you can’t really pick an overall leader. Seagate, Maxtor, Iomega, Western Digital are all top-flight manufacturers, and intense competition in the hard drive industry means you won’t save much by buying a no-name brand. Warranties are a more important factor to consider. A reliable hard drive, internal or external, should come with a three to five year warranty. Finally, bundled software may be important to you if you don’t already have backup software. [CAUTION] Hard Drive Makes a Clicking Sound? [HARD DRIVES] Is Yours SMART Enough? [SSD] Time to Upgrade Your Hard Drive? How Long Will Your Hard Drive Last? SSD Drives: How Long Do They Last? Should You Partition Your Hard Drive? The Most Reliable Hard Drive? Time to Start Encrypting Your Stuff? Help, I’m Stuck in a Wifi Dead Zone! Most recent comments on "All External Hard Drives are Not Created Equal"
If you go to Newegg.com they have the best deals. I just bought a seagate 500gb 2.0 for 59$ minus 10$ for first time buyer 49$. They will try to upsell you Acronis which really is the best in the buisnesss for backup/images. But if you buy a Seagate or Western Digital they both have a free version of Acronis for their drives. You can download the free versions from here. Acronis free utility for Seagate drives. Acronis for western digital external drives. How about companies like Samsung or Toshiba. I have seen their hard drives for sale as well. Do any external hard drives do an automatic back up? I've had several Western Digital external hard drives, including both portable and non-portable models. All but one have permanently failed within a year. Ironically, the one I bought on a clearance table has been the only one that hasn't. It's an old 160 gig model I rarely use. That's probably why it still works. I have an Intel Mac, so I don't know if that made a difference. I did buy three HP 1TB external hard drives for my Intel Mac (that were originally formatted for PC and have PC backup software) and all three have been working fine for well over a year. I bought them at Costco. I'm not even sure HP makes external hard drives anymore, but I'd definitely buy an HP external hard drive again if they were available. Anyway, I know people who swear by Western Digital hard drives, but I just swear at 'em. I use a Western Digital Portable 320GB USB 2.0 Drive to store my data. It came with preloaded with backup software, which takes up room. I reformated the drive and gained more space. I drag and drop my data on it and it works very well. I bought the unit from Costco which included a case and USB Wire. 2. the external drive can replace the internal drive if the internal drive is dying (a hardware problem). This article is very timely I am thinking to buy more external hard drives but there were some question though you have already answered but still need some clarification. You said "If speed is a crucial factor for you, check your computer’s manual (or inspect the ports if you’re familiar with them) and purchase a drive with the fastest connection that your computer will support." Question is by checking computer's manual or inspecting the computer's port how come we know about speed? EDITOR'S NOTE: You can see if you have USB 2, USB3, Firewire or eSATA ports. I have three external hard drives. First, a one I made with a very good enclosure and an 2.5, 160 Gb. It is permanently connected to my desktop Linux computer. I've had no problem on it, except I created two partitions. Second, a Samsung 160 Gb, which I've been using as backup. Lately I bite a retail offer an got a Tb drive. It is fine also, except my Linux cannot acknowledge it, and is my backup store by now. All my drives are USB. Recently I went from a full-sized tower with 4 hard drive bays to a laptop. I did not want to give up my large (500 gig to 1 T) internal hard drives for one external hard drive so I did research and discovered an alternative... hard drive enclosures. I found StarTech.com and purchased their SAT3540U2E. It holds 4 of my internal hard drives and all of the data I had collected through the years. I'm not saying it's the right solution for everyone but it sure saved me a lot of time, trouble and money. Plus, when I'm not using it, I can turn it off... saves electricity and strain on my laptop. "Portable drives max out at 1 TB, but capacities of 250 MB to 750 MB are more common and less expensive." You must have meant GB. I recently had a hard drive crash on me in my computer. I built the system with the help of a friend ( an upgrade of my previous system in the same case). When I went to replace the crashed drive, I discovered that it was an entry level Western Digital drive, which one store told me has had some issues. My enquiries led me to discover that there are different quality levels in hadr drives, just like in most consumer products. I am surprised that Bob didn't cover this issue in his article. I purchased a Seagate 7,200rpm unit, which I was told is a middle level unit. This hard drive can be used an external drive in a case. I'm with Lanny. I have several left-over HDs and can't see any sense in buying a fixed-size external. So, instead I buy external cases. Those I can always "upgrade" with a larger size drive. The ones I'm getting now can hold either IDE or SATA. That makes them more versitle. A word of warning: do not change the drives very often. The enclosure connections are not designed for frequent swapping of drives. On an only tangentially related note, I picked up a hard drive to USB adapter for around $20 a couple years back, as it seems I'm always up-sizing my hard drives and have a half dozen old ones laying around. It connects to IDE, ATA and SATA type While I wouldn't recommend leaving a bare drive laying out all the time, it has proved quite handy. As an added bonus, I've been able to recover data from a few friends' drives that have been damaged or have corrupted boot sectors. Where are they manufactured? If Seagate, Iomega, Western Digital, et al, all source from China, then Transcend (Chinese) is a good brand and just as reliable (I've been using them for at least 5 years). Besides, here in India, it is far more widely available than the other brands. Bruce, I've never heard any hard drive called "entry" level. For Western Digital, there is a Black, Blue, and Green series of which the difference is power usage and speed. The quality of each should be about the same. Saying a hard drive is an entry level, especially in this market which prices plunging and capacity increasing, is some kid trying to sell a more expensive drive. The price of a drive depends on the speed, capacity, and interface. There is no "entry" level hard drive. I have had experience with Seagate, Maxtor, and WD external HDs. The Seagate 500GB was my first. It worked great until it fell off the table I was using. That is one of the big problems with any computer is what happens when there is an accident. I tried a recovery company in LA but they were not able to recover my files which my photos were the most important. They are forever gone. I learned an expensive lesson so now my ext HD are now on the floor away from traffic. The next ext HD is the 700 GB Maxtor which is working beautifully however with my videos it was getting full. The last ext HD I have now is a WD 3 TB which was working fine until my computer crashed. Ater I got my computer fixed I was not able to get into the WD ext HD. I tried a recovery porgram but it did not work. This was not a physical damage like with the Seagate. I emailed WD several times and I read their manual. None of which helped until several weeks I finally got through to a tech who I could understand. The manual had said you can not use the HD with other computers so that was the bummer since my computer after being repaired was considered another computer. Their security system was defeating me. The final tech finally gave me the key which turned to be something I should have remembered. It was to make all hidden files visable. By doing that I was able to reload the WD program but the problems weren't totally solved until I went into the properties of each file and unchecked hidden. Now everything is ok but I doubt if I buy another WD product again. It has been an expensive lesson but I am learning. All the HD us USB. You are right not all ext HD are created equal. I just wanted to let you know how much you have helped me decide on products to buy and how to fix my computer. Please never stop doing this I trust your judgements.